Why can't I insert formulas from MS Math Input Panel app? 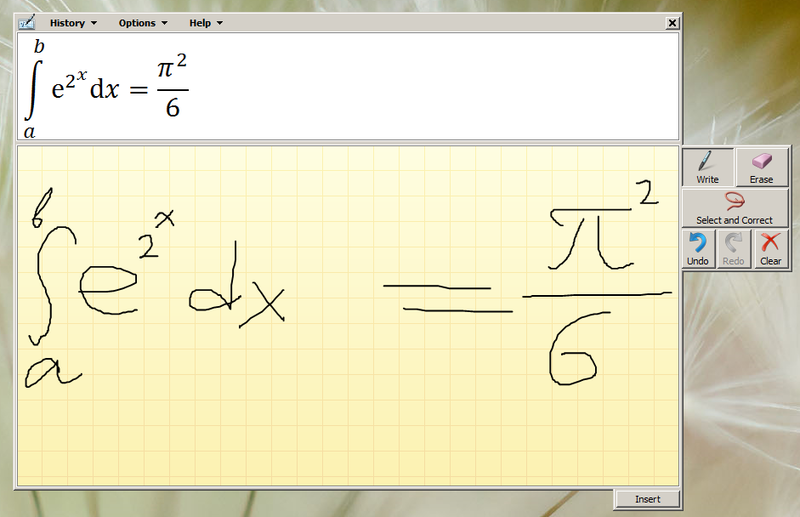 So I just tried to write a simple formula with Microsoft Math Input Panel and it didn't work. When I press the "insert" button in the app, nothing happens. Is there a way to make it work? I suspect the issue can be in the browser, as it may not be recognized as a compatible MathML application, with which this app is supposed to work, as per its help file. This app is included in all editions of Windows 7. It'd be a shame for it to be useless for SE sites. The answer below was written under the assumption that you could get MathML markup from Math Input Panel. This turned to be false. The Math Input Panel doesn't offer fallback text representations of the XML markup on the clipboard. Marko Panic, the program manager for the development of this tool confirmed to me that this was a design decision as they didn't want the end user to be faced with raw XML. What a wasted opportunity. The Input Panel generates MathML markup for your formulas, but it won't give it to the user. It could be that seeing an XML tag was found to cause brain damage in Microsoft users, I'm not sure. The result is that the Input Panel works only with expensive products like MS Word and MathType, which are designed to receive the data in the way that the input panel produces. If you don't mind spending $97 on MathType, then that may be a solution: MathType claims to produce LaTeX in a way that is "MathSE-compatible". I'd rather not link to their site. In case anyone is interested in what Math Input Panel looks like (I never saw it until today), here is a screenshot. The insert button is the only thing that outputs the markup, and it bypasses the user, sending data directly into the application that currently has focus. Math Input Panel outputs your equations in MathML format. MS Word, its OpenOffice analog, and some other software can render MathML. Browsers, for the most part, cannot do it natively, but with the MathJaX script they do. The main problem is that SE is not configured to allow MathML tags as user input. MathJaX should understand that $<math> ... </math>$ is MathML pretending to be TeX to avoid MarkDown. MarkDown parser should treat <math> ... </math> the same way it treats $ ... $ now, i.e., ignore it. The second solution is cleaner: you'd be able to paste MathML without surrounding it with extraneous dollar signs. It is also better future-proof, if in the future browsers begin to support MathML directly and scripts like MathJaX will no longer be needed. I'd like to see the second solution implemented here. It would take some work, but I think it's doable. Not the answer you're looking for? Browse other questions tagged support mathjax formatting . Why debris from previous questions in question input box? Why can't I read formatted text? Why can't I use Chat? I cant see math formulas. How to input matrices when posting questions at Math StackExchange? Why can't I see any mathematical text/latex?